While I was making the kits for this card for the All Occasion Class I made this card!! It uses a spoiled embossed layer in that because I misjudged the location of my little cutting plate I cut part of the die next to the butterfly on this large die. 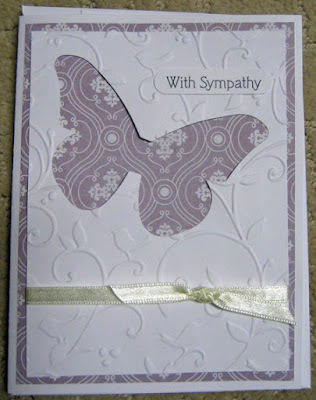 I burnished the slit closed and added regular tape on the back and it still showed after I embossed the layer so I decided to use this one to make a sympathy card and simply added a little greeting over the the mistake and no one is any the wiser!!! So this card sketch works with or without a greeting! You can check the ones without a greeting here that I created for my All Occasion Class last week! !